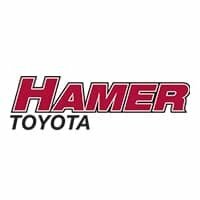 We had an excellent experience purchasing a Toyota Highlander from Hamer Toyota. Steve Denson was very knowledgeable, efficient, and understanding, and when it came to our specific requirements regarding interior, engine, color, or price, he made sure all of our requests were met. Great service with courtesy, kindness, and smile! Thank you. Holly hell! This place is busy. Expect to wait. The sales force is very friendly and knowledgeable, we worked with Mr.Mango. He gave us a quoted price, we told him we weren't sure if we would purchase today and he was friendly about our decision (his attitude and demeanor did not change when he realized a sale wasn't happening today- which is typically what you see at other dealers). He continued to follow up with us and has updated us with new inventory. Wendy Magno was the best and friendly salesman. He had the most comforting and trusting ability to help understand each choice that I had in purchasing my brand spanking new Toyota Tacoma. I appreciated the specialized and focused attention he had on my family. Love to shop there for car. Best ever experience of purchasing my new Toyota Camry at Hamer Toyota. No pressure, no back and forth negotiating the price, treat customer with high respect. Next time when you shop for your new vehicle, make sure come to Hamer Toyota. The customer service satisfaction we received from Matt Morente along with Wency was exceptional. They made our car buying very easy. This is our 3rd car from Hamer Toyota and we would not wanna go elsewhere. Thank you again for helping us get our brand new vehicle.